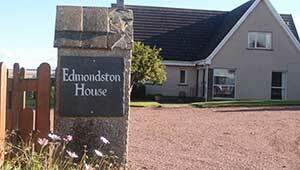 Edmondston House is well suited to for fishing parties, family parties and reunions. 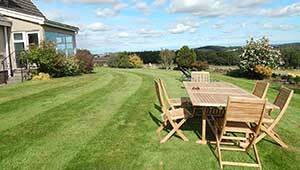 A perfect, central location for groups arriving from North and South or West and East. 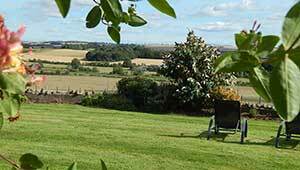 Edmonston is surrounded by lawn and a colourful herbaceous border and summer house. There are paddocks for football and table tennis in the garage. A good flat lawn for croquet, boules and badminton. There is an all-weather tennis court at the farm. Pretty walks on the door step. Upstairs there are four bedrooms. 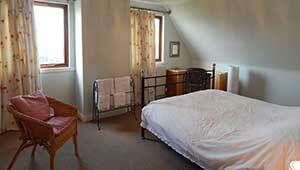 One double en suite (bath with shower ), two king size and one twin room and a bathroom with shower. Downstairs there is a twin room with a total of 4 single beds if required, making it a good family room. Opposite this room is the shower room, wc, utility room with large washing machine and tumble drier. The kitchen is well equipped with an electric cooker, microwave, fridge and dishwasher. 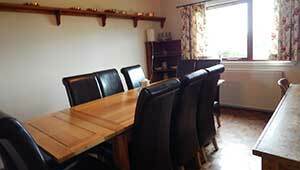 There is a round kitchen table for 6 and adjacent to the kitchen is the dining room which seats 10 + 4. Hostess trolley and serving table and a serving hatch from the kitchen to the dining room. The sitting room seats 10 comfortably and it extends to the sun room which seats 4 – 6. A wonderful view! WiFi. Log fire and oil central heating.